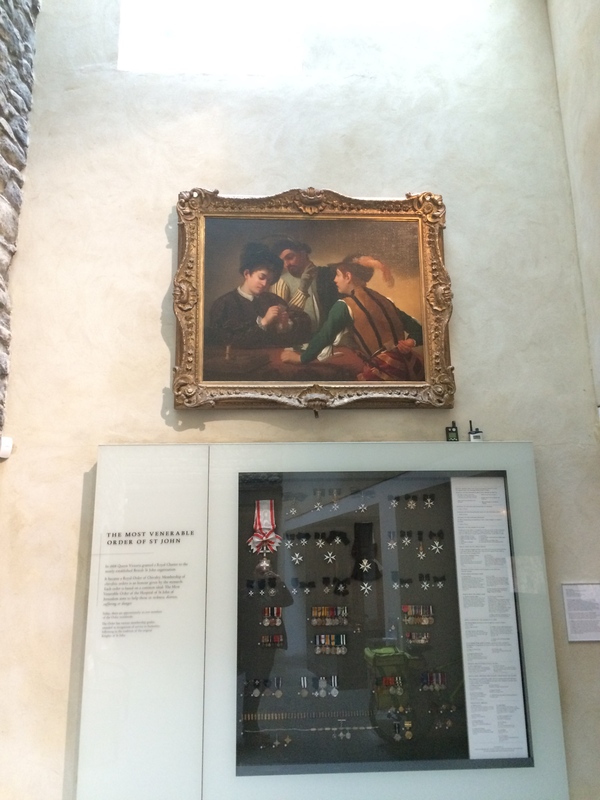 This week the verdict was in on the Mahon version of Caravaggio’s Cardsharps which has been hanging at St John’s Museum on Clerkenwell. 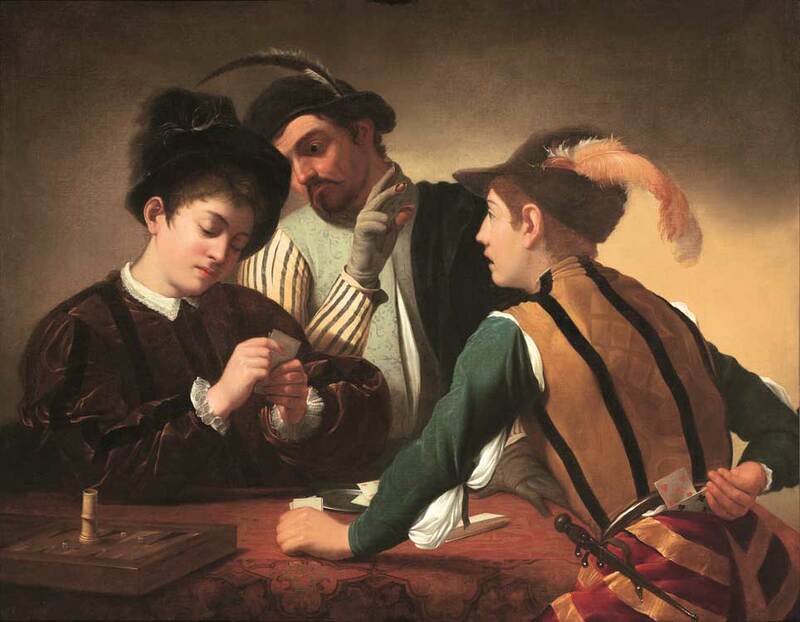 You’ll know the backstory by now: back in 2006, a version of Caravaggio’s painting in the Kimbell Museum, Fort Worth, was bought at Sotheby’s Olympia for £42,000. The buyer, the late Sir Denis Mahon, a great collector and a great connoisseur of the Italian Baroque, unveiled it as an original and insured it for £10M. In October last year, the vendor Lancelot William Thwaytes sued Sotheby’s for negligence in not researching its authorship thoroughly. When I went to see the painting the other day, I thought it looked like a period copy. – the profile of the seated cardsharp had been opened out slightly from quarter-profile closer to half-profile. Quarter-profile is quite a difficult effect to pull off and it is exactly the sort of detail that gets simplified in copies. The direction of his glance seemed to be lost as well – no longer nervously glancing at his cohort but somewhere towards the dupe. 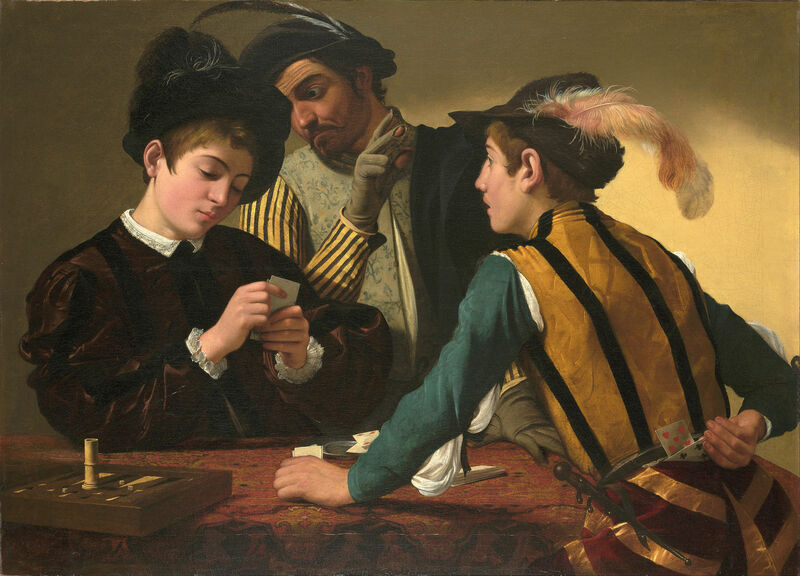 – the trompe l’oeil of the backgammon board projecting into the viewer’s space – the sort of effect that Caravaggio likes, compare with the fruit basket in the National Gallery Supper at Emmaus – was less successful and the detail of the dice-shaker was clumsier. – the seated dupe’s sleeve was heavier, and there was no sense of the patterned fabric. – as a whole you didn’t feel that you were looking at a moment frozen in time. A good painting looks as though it captures something happening for the first time. The interplay of glances that takes your eye round the picture -seated cardsharp to standing cardsharp to dupe – seemed to be missing and the result felt static. Condition might explain some weaknesses – rubbing, loss of clarity, ovepaint perhaps – but to me this couldn’t explain the overall impression of a second rank work. I was genuinely hoping for a transformative experience – St John’s is a lovely museum – but the painting was clearly a standard early copy, in a very beautiful English 1750s frame. As a lawyer my friend advised me to post nothing while the case was sub judice; as a connoisseur of paintings he pointed out that I was wrong in thinking the seated cardsharp’s belt ‘might be steel.’ In fact it must be black leather. I can’t find the photo he sent me of a leather-jacketed sleeve by candlelight. 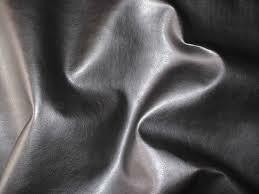 He had a Damascene moment over dinner, when he saw that black leather has a soft metallic sheen like beaten lead. This illustration makes the point almost as well as his photograph. So, the judgment was given, and everyone in the art world said, Yes I could’ve told you that. The poor old plaintiff, several millions out of pocket in legal fees, is going to appeal. It is a harsh business; the dogs bark and the caravan moves on. When I next speak to my friend I will ask him what the legal world says about it all. I won’t put the boot in to Sir Denis Mahon, a man who single-handedly rescued the Italian Baroque from a two hundred years of critical cold-shouldering, collected some of its finest paintings and left them to the nation. He even rediscovered the Kimbell painting in the 1980s, a stupendous coup, the sort of discovery that anyone would give their eyeteeth to make in a lifetime, and Sir Denis made many of them. So how did this current scenario come about. Even Homer nods, perhaps. The best scholar can fixate on an attribution, like Ahab on his white whale. But leading Caravaggio experts went with him. Perhaps there is a lack of direction in Caravaggio scholarship. There seem to be a lot of voices – quot editores tot Caravaggii – and no one authority. And perhaps there’s too much deference and courtesy. Did the Italian scholars who supported the attribution test it with the same rigour they would have done if it was proposed by anyone else? Perhaps the whole oeuvre needs a shake-up. This week we watched the first episode of Wolf Hall based on the first two books of Hilary Mantel’s Cromwell trilogy. I got the date wrong in the last post, thinking that it started on January 27th. Tuesday is much better; a welcome light in the week’s bleak beginning. Thinking of light, Zak bet that people would complain about the director Peter Kosminsky’s decision to shoot internal scenes by candlelight. He was right, they did, the miseries, but we thought it was a superb atmospheric touch. Wolf Hall was engrossing, compulsive and real. We were in from the start. I particularly liked the way that Henry was held back right to the end of the episode, and then appeared in a brilliantly sunlit garden, as if Cromwell has suddenly arrived in a new world. Dad pointed out the the way that Cromwell’s conversation with the King was shot from Cromwell’s viewpoint, symbolically di sotto in su. We had been worried at this end about Damian Lewis’s Henry. We’re watching Homeland at the moment and we thought Lewis might be too ‘internalised’ an actor to convey Henry’s vast presence. My idea of him is shaped by Keith Michell in The Six Wives of Henry VIII and Robert Shaw in A Man for All Seasons, a kind of threatening bonhomie – you’re afraid of him, but at the same time you genuinely want him to like you. Lewis’s more reserved Henry hints at greater depth. Eustache Chapuys, Imperial Ambassador and More’s friend, often finds More a dinner guest of merchants and diplomats, but his despatches, like other reports of More’s conversation, convey a cruel wit and none of his supposed warmth. The humanity and honesty that Mantel finds in Thomas Cromwell rehabilitate a ruthless operator despite the fact that he engineered a string of judicial murders. Mark Rylance’s portrayal conveys such compassion and understanding that you are moved almost to tears by a single glance. That was politics back then, we think; a binary, zero-sum game. Understanding More with his private torture chamber for heretics is another matter; it would be quite a feat to rediscover him for a modern audience. A challenge to future writers, perhaps. Tonight we’re looking forward to Waldemar Januszczack on Holbein (BBC2 9pm). I’m meant to be writing the next post about Henry’s portraiture, and the final, ‘autocratic’ phase begins with Holbein’s Whitehall Palace mural in 1537. Academics often say that Henry underused, or underappreciated Holbein, because his patronage of him was limited to a couple of portraits. Holbein didn’t seem to lead a massive cultural Renaissance, or leave a direct legacy in English painting. Setting aside the vast number of temporary works, interior decorations and designs for silver and jewellery that Holbein produced for the King, this misses the point I think. Holbein did exactly what Henry wanted him to – he produced an unsurpassable Royal portrait, which other painters could then copy. Whether it was Holbein or Henry himself who decided to alter the final pose from three-quarter profile to full face – the NPG cartoon shows the original position – the final version is the perfect icon of Henry’s power, aggressively staring down the viewer. Nothing else was needed except to reproduce it in vast numbers throughout the country. It was a propaganda campaign unparalleled in English history. I was playing with the statistics of it the other day – there must be about 200 hundred Sixteenth Century versions of Henry’s portrait surviving today. If you add on another few hundred for those that have been lost over time – and twenty workshops could easily have produced 50+ each in the remaining ten year of Henry’s reign, let alone the rest of the century – they make a stunning visual impact on a population of only two and a half million. The other day I heard that, after the next round of manpower cuts, there could be one policeman per 1,750 of the population. That is about the same per capita ratio as the distribution of Henry’s portraits.